exhaustive, and do not form part of our licenses. and conditions of the license they choose before applying it. such as asking that all changes be marked or described. synched in timed relation with a moving image. accordance with the terms and conditions of this Public License. Commons as essentially the equivalent of this Public License. that applies to Your use of the Licensed Material. Public License are Attribution and ShareAlike. Licensed Material and that the Licensor has authority to license. equivalent rights anywhere in the world. under this Public License. Your has a corresponding meaning. b. produce, reproduce, and Share Adapted Material. (4) never produces Adapted Material. b. Additional offer from the Licensor—Adapted Material. under the conditions of the Adapter's License You apply. reserves any right to collect such royalties. hyperlink to, this Public License. Adapted Material You produce, the following conditions also apply. later, or a BY-SA Compatible License. context in which You Share Adapted Material. rights granted under the Adapter's License You apply. Section 4—Sui Generis Database Rights. all or a substantial portion of the contents of the database. Rights include other Copyright and Similar Rights. Section 5—Disclaimer of Warranties and Limitation of Liability. ALLOWED IN FULL OR IN PART, THIS DISCLAIMER MAY NOT APPLY TO YOU. IN PART, THIS LIMITATION MAY NOT APPLY TO YOU. 2. upon express reinstatement by the Licensor. will not terminate this Public License. Section 7—Other Terms and Conditions. terms or conditions communicated by You unless expressly agreed. independent of the terms and conditions of this Public License. be made without permission under this Public License. processes of any jurisdiction or authority. Creative Commons is not a party to its public licenses. Creative Commons may be contacted at creativecommons.org. 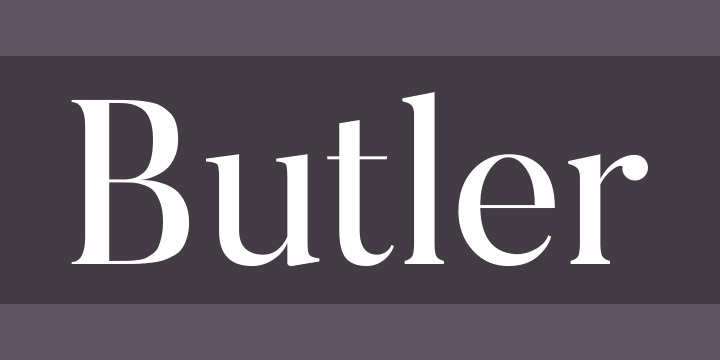 Butler is a free serif typeface inspired by a mix between both Dala Floda & the amazing Bodoni family. The main goal was to bring a bit of modernism to serif fonts by working on the curves of classical serif fonts and adding an extra stencil family. Great for posters, very big titles, books & fancy stuff, the highly contrasted butler typeface is pleased to be at your service. The whole Butler family contains a total of 334 characters, 7 regular weights and 7 stencil weights, text figures, ligatures, fractions and a lot more. It also suits many different languages with its added glyphs.